The Lady's Slipper was adopted as the state flower in 1902. 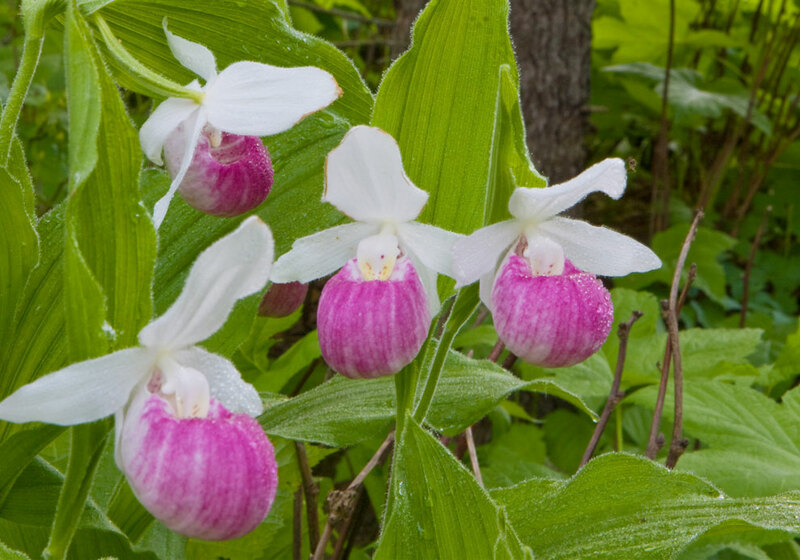 The pink and white lady’s slipper (Cypripedium reginae), also known as the showy lady’s slipper or queen’s lady slipper, was adopted as the state flower in 1902. Found living in open fens, bogs, swamps, and damp woods where there is plenty of light, lady’s slippers grow slowly, taking up to 16 years to produce their first flowers. They bloom in late June or early July. The plants live for up to 50 years and grow four feet tall. A century ago, the showy lady’s slipper was a favorite adornment in rural church altars during the summer. Since 1925 this rare wildflower has been protected by state law (it is illegal to pick the flowers or to uproot or unearth the plants). The specimens pictured here were growing near Chaska.